If you need to lift your vehicle, there is only one easy way to do it. Use a floor jack. Safer because of their more stable footprint and easier to lift due to their long handles and horizontal cylinders, floor jacks really do offer the best of both worlds. They are truly an accessory that professional mechanics and home car enthusiasts love. Our Best Floor Jack Reviews of 2019 will provide you with everything you need to know to make the perfect choice for you and your vehicle. We have reviewed the top products on the market for 2019. Our review has something for everyone as it covers a wide range of lift capacities, lift ranges, weights and price points. Check out our top picks. Although we have highlighted these 4 floor jacks as top picks, the 12 we have chosen (out of hundreds) are all top performers. If you are looking for a slightly different combination of specifications, all the relevant information is included at the top of each review. Capacity: 1.75 Ton. Profile: Normal. Material: Aluminum. Pounds: 40. Lifting Range: 3.5 to 16.5 inches. Model #: 66175FASJ. Why Buy? : Highest quality, ultra-lightweight jack available. Well constructed 1.75 ton compact floor jack that is lightweight and very easy to maneuver. Folding handle for convenient storage. Lift range 1-2 inches less than other top jacks. Why is the Sunex our Editor’s Choice? If you’re not a power user or do not drive a heavy SUV or truck, the Sunex may be the perfect choice. It is simply the best lightweight floor jack on the market. Sunex has been known for its lifting products since 1977. The build quality is what you would expect from a company with Sunex’s pedigree. Tipping the scales at just under 40 pounds and measuring only 23 inches, it fits easily into the trunks of all vehicles. The folding handle is perfectly located so that the jack is evenly balanced when lifted. The small footprint and built-in hook are ideal for storing in small garages or other tight spaces. Check out the Sunex Folding Jack in action in this manufacturer video. The telescoping handle provides great leverage, and only 5 pumps are required to reach max height. The action is very smooth both lifting and lowering the vehicle. A rubber lined jack saddle helps lower the risk of vehicle slippage. As good as the Sunex is, no floor jack is perfect. While the Sunex is a premium product with a premium price, its size/ease of use/quality of craftsmanship combination make it a pound for pound champ. Comes with a 1-year warranty. Capacity: 3 Ton. Profile: Normal. Material: Aluminum. Pounds: 56. Lifting Range: 3.75 to 18.1 inches. Model #: ALJ3T. Why Buy? : Lightweight for 3 ton jack. Premier brand. High quality, aircraft grade aluminum 3 ton floor jack. Has all the features to be an everyday shop jack. Why is the ALJ3T our Editor’s Choice? Sometimes you just need a little more oomph. The ALJ3T provides that and then some. Made out of aircraft grade material with a hefty 3 ton lift capacity, this jack is one of the best available on the market today. While not billed for lowest slung sports cars (3.75 inches tall at the jack saddle), it works on virtually all “normal” vehicles. Two thing stand out about the AL3JT: ease of use and craftsmanship. For a hydraulic jack that will lift 3 tons, it only weighs 56 pounds. That is an excellent pounds-to-performance ratio. It also comes with handles on both sides to make moving and storage easier. The AL3Jt reaches a respectable 18 inches, and the dual pump piston only requires 6 hand pumps to max out. Craftsmanship is top notch. The jack feels sturdy and incredibly well designed. With matte silver and black styling, the ALJ3T looks like an industrial work of art. It is a strong candidate for best 3 ton floor jack on the market and only weighs 56 pounds. An easy Editor’s Choice. Capacity: 2 Ton. Profile: Low. Material: Steel. Pounds: 104. Lifting Range: 2.75 to 24 inches. Model #: 6602LP. Why Buy? : Truly best in class lift range maxing out at 24 inches. Great reviews. Well built floor jack. Reaches an impressive 24 inches in only 6.5 hand pumps. Great floor jack from a well respected company. Why is the Sunex our Best Low Profile? The Sunex Low Rider is one of the “go to” floor jacks for sports cars, exotic cars and any other close to the ground vehicles. Its impressive maximum height of 24 inches also works well for larger SUVs and trucks. That’s the main differentiator of the Sunex Low Rider; it goes really low and reaches really high. Beyond that, it is simply a well made, rock solid floor jack. Very heavy for a jack with a 2 ton lift capacity. Manufacturer provides a 1 year warranty. Capacity: 1.5 Ton. Profile: Normal. Material: Aluminum. Pounds: 31. Lifting Range: 3.25 to 14.75 inches. Model #: HA68053. Why Buy? : Affordable jack for casual use that easily fits in trunks. Very affordable floor jack that is easy to use. Ideal for the casual user on a budget. Why is the Pittsburgh our Best Value? For drivers with 1 or 2 vehicles that rarely use a car jack, the Pittsburgh Racing may be ideal. It weighs just over 30 pounds. With a handle that can be removed and disassembled, the Pittsburgh fits easily into car trunks or tight spaces in garages. With its Rapid Pump technology, it can lift a vehicle in as little as 3.5 pumps of the handle (max 5). A medium sized, rubber covered jack saddle helps prevent slippage. While not the leader in any one category, the Pittsburgh Racing Jack provides very solid performance at 50% to 75% cheaper than our other top floor jacks. 1.5 ton capacity limits usage to compact and midsize vehicles. A 90 day manufacturer warranty is included. Capacity: 3 Ton. Profile: Low. Material: Steel. Pounds: 79. Lifting Range: 2.8 to 19.8 inches. Why Buy? : Great value for a 3 ton, low profile floor jack. Why is the Pittsburgh our Best Value Runner Up? Pittsburgh is more of a mass market brand than a premium brand. Don’t let that fool you. They make great floor jacks that customers love. The Pittsburgh is a very strong contender for best floor jack for the money. Its lifting distance is one feature that really stands out. With a saddle height under three inches, it works great on sports and exotic cars. It also extends to almost 20 inches, which makes it suitable for SUVs and trucks. The Pittsburgh comes with an extra wide 13 inch foot print for added stability and safety. At 79 pounds, it may be a little bit heavy for some people but still very manageable. Solidly built, great extension and a VERY attractive price, make this one of the most appealing floor jacks available today. Definitely check it out. Only a 90 day warranty. Capacity: 3 Ton. Profile: Normal. Material: Aluminum. Pounds: 58. Lifting Range: 3.75 to 19 inches. Model #: NSJ0302. Why Buy? : Awesome looking, great performing floor jack. Lightweight premium model floor jack with 3 ton lift capacity. Nice added features not found on other jacks. Why is the NOS our Best High End Model? The NOS Pro Style is the type of car maintenance accessory that people use for decades. Great looks, great specs and great performance make the NOS truly a premium product. Providing 3 tons of lift and coming in at only 58 pounds, the NOS provides the exact same performance as our Editor’s Choice ALJ3T. It has nice touches befitting a premium product that are not available on most floor jacks. A safety valve prevents overloading and injury to both the jack and the user. Padded side handles make the jack easier to carry and will not hurt your hands. A foam bumper pad on the handle helps prevent accidental scratches to car paint. The rubber jack saddle provides a good firm grip to prevent slipping. All in all, the NOS is a great looking, great performing floor jack. Capacity: 2Ton. Profile: Normal. Material: Steel. Pounds: 30. Lifting Range: 3.5 to 14 inches. Model #: F-767. Why Buy? 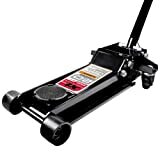 : Only floor jack on the market under $50 that gets decent reviews. Lightweight 2 ton steel floor jack with the lowest price in the segment. Why is the Pro-Lift our Best Ultra-Budget Model? A decent quality floor jack for under $5o is VERY difficult to find. The Pro-Lift fills a gap in the market. The 767 weighs just under 30 pounds and has a very small foot print at 17.9 x 5.3 x 8.5 inches. This makes for a very compact floor jack that fits in all vehicle trunks and stores easily. It has a nice top mounted carry handle and a couple of premium features like overload protection and a bypass device to prevent over-pumping. If you are on a very tight budget, the Pro-Lift 767 is worth a look. Lowers vehicles quickly; not a slow gentle release. The Pro-Lift comes with a 90 day warranty from date of purchase. Capacity: 2Ton. Profile: Normal. Material: Aluminum. Pounds: 50.4. Lifting Range: 3.5 to 20.1 inches. Model #: ALJ2T. Why Buy? : If you only need a 2 ton capacity, this jack has it all. Lightweight, premium aluminum 2 ton floor jack. Great reach and quality craftsmanship. The ALJ2T is the little brother to our Editor’s Choice. The main differences are a 2 ton lift capacity (vs 3 ton) and 8 pounds less weight for easier maneuverability. The ALJ2T packs a lot of performance into its 50 pound frame. A 2 ton capacity AND a 20 inch maximum lift height are excellent performance metrics for such a lightweight floor jack. A rubber saddle jack and a bumper pad on the handle help prevent damage to paint and clear coat. Oh yeah, it will also impress your friends with its industrial great looks. The cons are the same as the ALJ2T as well. Other than being a little lighter and having a slightly better max lift height, the ALJ2T is simply a 2 ton version of our Editor’s Choice ALJ3T. It comes with a limited 1 year warranty. Capacity: 2Ton. Profile: Normal. Material: Steel. Pounds: 67. Lifting Range: 3.5 to 18.5 inches. Model #: XL20. Why Buy? : Very affordable price for a well constructed jack from a premium brand. Solidly built 2 ton steel jack. Solid construction and respectable max extension. Very manageable weight for a steel jack. The XL20’s selling point is a lot of floor jack at a very affordable price. It has all the features of our other top picks. Dual pump pistons make quick work of lifting even heavy vehicles. The Universal Joint Release ensures a slow and steady descent once you’re done. At only 67 pounds with a 26 inch chassis, the XL20 is relatively easy to lift and store. It does not require much space. Because of its steel construction, you can get top quality performance at half the price of lighter models. Craftsmanship may be a half notch below but is still very good. Some reports of wheels seizing up and not rolling. The XL20 comes with a 1 year parts and labor warranty. Capacity: 2 Ton. Profile: Low. Material: Steel. Pounds: 97. Lifting Range: 2.75 to 24 inches. Model #: XL2T. Why Buy? : Top of the line lift range and low profile makes this a great jack for all vehicles. Low slung jack with an extra long chassis. Great for sports and exotic cars. The XL2T is a workhorse that is ideally suited for anyone that needs reinforced steel construction and a best in class lift extension. Other than that, all the other features are pretty standard: 2 piece handle with a bumper pad, 4 inch saddle jack, dual pump rapid lift technology and bearing mounted swivel caster wheels. If you have either low slung cars or tall trucks and SUVs, this may be the perfect accessory for you. Twist release valve can be a bit stiff until broken in. The XL2T has 1 year limited warranty. Capacity: 3 Ton. Profile: Low. Material: Aluminum Pounds: 58. Lifting Range: 3.5 to 19.75 inches. Model #: 80077. Why Buy? : Most low profile floor jacks are steel, this one is aluminum and a VERY good performer. Well designed 3 ton aluminum floor jack. Sporty looks and very manageable at 58 pounds. The JEGS closely resembles our Best High End Floor Jack, the NOS NSJ0302 in its design. It features sporty yellow and black paint. Two side handles and a two piece pump handle make for easy maneuvering and storage. Max extension is excellent at just a hair under 20 inches. A large, almost 5 inch jack saddle, helps minimize slipping and accidents. The saddle rotates 360 degrees which is a nice touch. This helps prevent scratches and marring. If you really like the NOS but do not want to spend the extra ~$80, the JEGS may provide the perfect compromise. They have almost identical specs and a similar high octane look. The JEGS has a 1 year warranty. Capacity: 3 Ton. Profile: Low. Material: Aluminum & Steel. Pounds: 60. Lifting Range: 3 to 19.7 inches. Model #: 6930SG. Why Buy? : Affordable low profile floor jack with excellent reviews. Lightweight construction 3 ton floor jack with excellent lift span. The Liftmaster is made from a lightweight frame and is equipped with a heavy duty steel lift arm to prevent bending and breaking. Another interesting feature is that the jack saddle can be removed to get below 3 inches. While this may not seem like much, a half an inch can make a big difference with some sports and exotic vehicles. Beyond that, lift capacity, lift range and pounds are in line with other floor jacks in our roundup. The Liftmaster is 25% to 30% cheaper than competitors with similar designs and specifications. Relatively quick release when lowering vehicles. Below are the specifications of our chosen floor jacks in one handy table. There are many types of vehicle jacks: bottle, scissor, floor, factory OEM, just to name a few. A floor jack is a hydraulic jack mounted on a 4-wheel base. The hydraulic cylinder is mounted horizontally. An extendable handle at the back of the floor jack, allows users to raise their vehicle with 5-8 pumps of the handle. Each floor jack has a round element that is usually rubber coated with metal side guards called a “jack saddle.” The jack saddle is the part that touches the vehicle when lifting. Many have side handles that can be used to help carry and store floor jacks when not being used. Floor jacks are the most common type sold on the upgrade market. There are several things to consider when buying a new floor jack. Lift Capacity. When it comes to lifting your vehicle, we are fond of the saying, “overkill is underrated.” The means we prefer to have more lift capacity than actually needed. If your vehicle weighs 4,600 pounds, will a 2 ton jack lift it? The answer is almost certainly yes. Even though the car weighs more than your jack’s capacity, you are usually only lifting one corner of the vehicle and thus, not the total weight. That said, know the weight of your car and make sure your floor jack is up to the job. We always prefer the lift capacity to meet or exceed the curb weight of a vehicle. Profile. Floor jacks have a minimum height. This is measured from the top of the jack saddle to the ground (usually less than 4 inches). Some models are too tall to get underneath low-to-the-ground sports cars or roadsters. You will see some floor jacks designated for sports or exotic cars. This means the front of the jacks are short enough (<3 inches) to lift low-to-the-ground vehicles without causing damage. Always check before buying. Max Extension. The jacks in our roundup range from 14 inches to 24 inches in max lift height. For most cars and small SUVs, extension is not a problem for routine activities like changing tires. However, if you have a large SUV or truck, especially if the vehicle has been raised with a lift kit or large tires, you need to make sure that any floor jack you choose will reach high enough. This is another key feature to check before buying. Ease of Use. Many floor jack models are heavy. Even lightweight floor jacks can weigh 40 pounds, with high capacity steel models tipping the scales at 120+ pounds. Be sure to know your personal physical limits and purchase accordingly. Lift Ease. This is a combination of how many time you have to pump the handle and how easy it is to pump the handle. Most of jacks will reach maximum extension in 5 to 8 pumps. Better quality floor jacks do not require that much pressure to pump the handle. Warranty. Floor jacks are put under more stress (literally) than almost any other tool in your garage. While all of the hydraulic jacks we reviewed are top quality, there will be occasional malfunctions when repeatedly lifting vehicles that weigh 2-4 tons. It is not uncommon for seals and jack handles to break. Check for manufacturers that provide at least a 1 year warranty AND has excellent customer service. Floor jacks are the best all around hydraulic car jacks on the market. They are not perfect though. Here are the main pros and cons. Best option for low profile sports cars. Relatively more expensive compared to other car jacks. Floor jacks are among the safest of all car jacks as they have a wide stable base and don’t require users to crawl under cars to use the jack. Below are the main things to keep in mind when using a floor jack. Check the rating of your jack and make sure it is sufficient for the job at hand. Ensure you have a solid and flat surface before using the jack. In a garage or shop this is rarely an issue. However, if you have a flat on the side of a gravel road, a soft surface can be unsafe. Place the jack on three quarter inch plywood, or something similar, to provide a solid foundation. If the ground is very soft (e.g., soft dirt), do not attempt to use a jack. Let roadside service professionals move the car for you. Put your car in park and ensure the parking break is engaged. If you are on the side of a road, also turn on your hazard warning lights. Use wheel chocks underneath tires as an added deterrent to rolling. Usually these are used on the opposite corner of the tire being lifted. Find an appropriate place for the jack saddle to contact the car. Most car user manuals provide instructions on where to find safe lifting points. Slowly pump the jack handle until the desired height is reached. Place jack stands under a strong part of the car, such as the axle, to hold the weight. You many not need jack stands for changing a flat tire, but jacks are meant to lift cars, not hold them up for a longer periods of time. Once complete, open the release valve slowly to gently lower the car to the ground. These are general safety best practices. Always check the instructions that come with your floor jack in addition to your car owner’s manual. Fans of the Dummies series can check here for an illustration. If you drive a vehicle long enough, at some point you will probably have to lift it for maintenance or changing tires. Having the best floor jack available makes the job not only MUCH easier but also MUCH safer. When purchasing a floor jack, remember to choose one with more lift capacity than your car weighs. Beyond that, the only other “must have” requirements are to get one that will fit underneath your vehicle and provide sufficient lift. 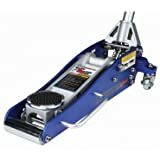 Floor jacks are absolutely fantastic auto accessories, and anyone who is serious about cars should own one. 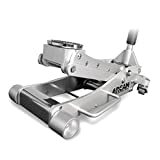 If you are considering a purchase, our Best Floor Jack Reviews of 2019 should provide you with everything you need to know to make the best decision for both you and your car. What is the difference between a bottle jack and a floor jack? Both are hydraulic jacks. One has a vertically mounted cylinder (bottle jack) vs. a horizontal cylinder (floor jack). Bottle jacks provide a much larger lift capacity, with some going up to 20 tons. However, they are higher profile and won’t fit underneath some cars. Also, they are less stable than floor jacks and are more likely to slip. 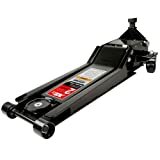 What are the best floor jacks for the money? We would certainly recommend any of the jacks in the Pittsburgh line (including our two Best Value jacks). Runners up would be the XL2T Steel Service Jack line. Being made out of steel versus aluminum keeps the price down. However, specs are still top of the line. The Pro-Lift 767 is an ultra budget jack for under $50. It doesn’t offer the same quality of durability as our top jacks, but is 50% to 80% cheaper. 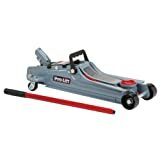 What are the best floor jacks for trucks? The two main considerations with hydraulic truck jacks are lift capacity and lift height. For half ton to heavy duty trucks, we would recommend a 3 ton floor jack with at least 19 inches of lift. 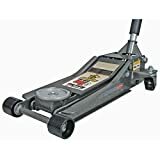 The ALJ3T, Pittsburgh, NOS Pro Style and Liftmaster lines are some of the best floor jacks for trucks. If your truck has especially large tires or a lift kit, measure the distance from the ground to the trucks lifting points before purchasing a floor jack. While they can be returned, jacks are very heavy and the process is a pain. Is there a floor jack made in the U.S.A.? The majority of floor jacks are made in Asia. Some are made in the U.S.A. Check out Hein-Werner as an example. Their focus is more on high-end, heavy duty equipment. What are the most common problems experienced with floor jacks? There is no survey data available to our knowledge. Our take would be seals around the hydraulic cylinder breaking, bent or broken handles, and wheels that break or seize up. However, these products are literally built to be put under a lot of stress. For the top jacks, less than 5% report problems in the first few years of use. Can I use a jack on a car that weighs more than my jack capacity? You can, but we do not recommend straying very far from the recommended guidelines. As an example, if you are changing a tire on a car, you are only lifting one corner, not the entire car. A 2 ton jack should lift one corner of a 4,200 pound car with few problems. That said, we strongly prefer having more lift capacity than you need. If your SUV weighs 5,200 pounds (2.6 tons), we would use a 3 ton jack. 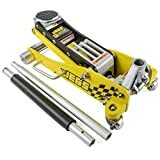 Should I purchase jack stands with a floor jack? Our point of view is “yes.” Hydraulic jacks are made for lifting vehicles, not holding them up indefinitely. That is the job of jack stands. If you are putting your body underneath a vehicle, you ABSOLUTELY should be using jack stands. Some people don’t bother with jack stands when changing flat tires, but even then, it is still a good idea to use them. When lowering the vehicle, how quick should the descent be? This is one of the biggest differences between premium and lower priced floor jacks. Ideally the descent should be slow and steady and feel very controlled. Lower end hydraulic jacks can let the car drop quickly and sometimes the descent will be a bit “jerky.” All of the premium models in our roundup are very smooth and steady. Can floor jacks be used for roadside emergencies? Yes, in fact they are safer than other types of vehicle jacks (e.g., bottle jacks) because of their superior foot print and weight distribution. Check and make sure the ground is flat and stable before using any hydraulic jack. If the ground is too soft, such as loose dirt or soft grass, DO NOT attempt to use a jack. The risk of an accident is just too high. Call for help. Your safety is worth it.